What’s the first thing you’ll notice when you step into the Paul Green Theatre to see Leaving Eden, aside from the incredibly intricate and bizarrely-shaped stage? 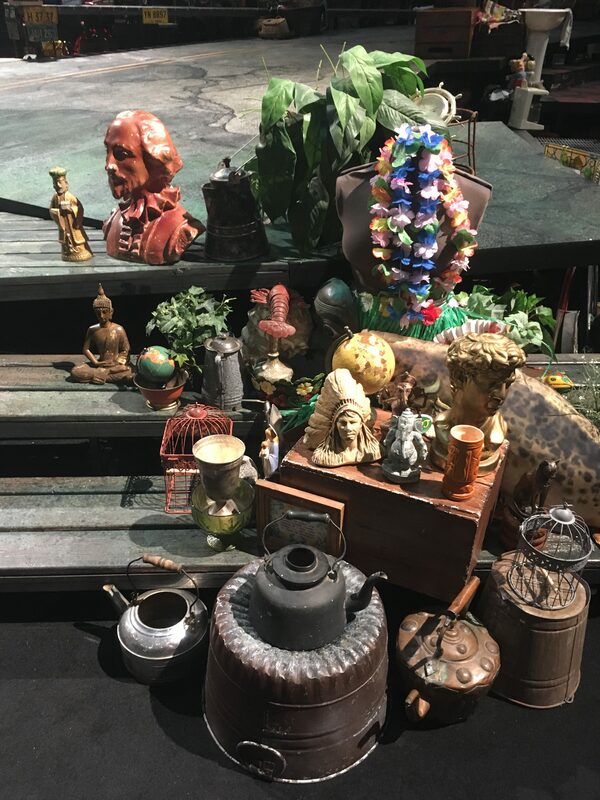 Tons and tons of miscellaneous objects line the perimeter of the stage, with everything from decades-old pictures to broken-down toys filling every nook and cranny of the set. “We cover it all up with this stuff. 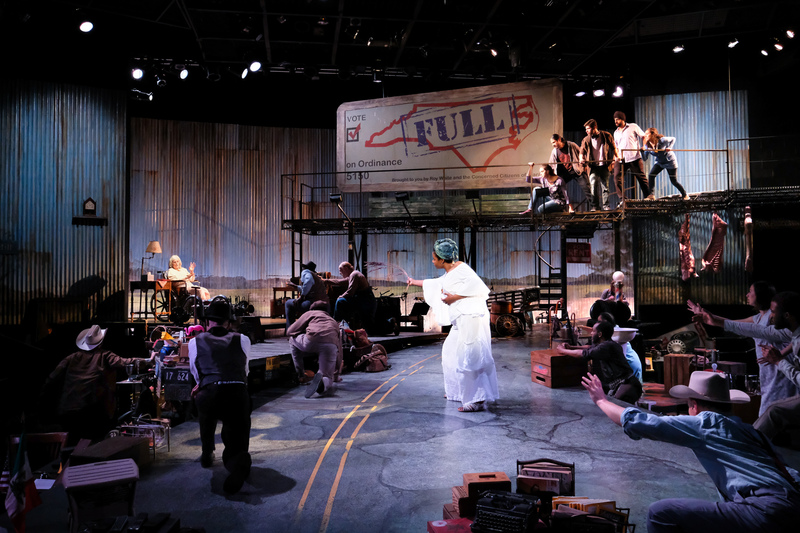 Pieces are here and there in strategic places for actors to pick up and use,” said resident designer Jan Chambers. What is a prop? As Propsmaster Andrea Bullock puts it, “If you were to take a doll house and turn it upside down, anything that falls out, is a prop.” Tables, chairs, lamps, books, plates, you name it: it’s a prop. The strategic placing of these items on and around the stage is called set dressing. For Leaving Eden these massive piles of “junk” are a mix of the purposeful and the random—as Chambers said, some of the props that may seem to just be part of the mix have actually been placed there specifically for characters to use as hand props, and few—called standables—have even been reinforced to support characters’ movements. “Gabe’s junk emporium takes place all over the set,” Chambers said. 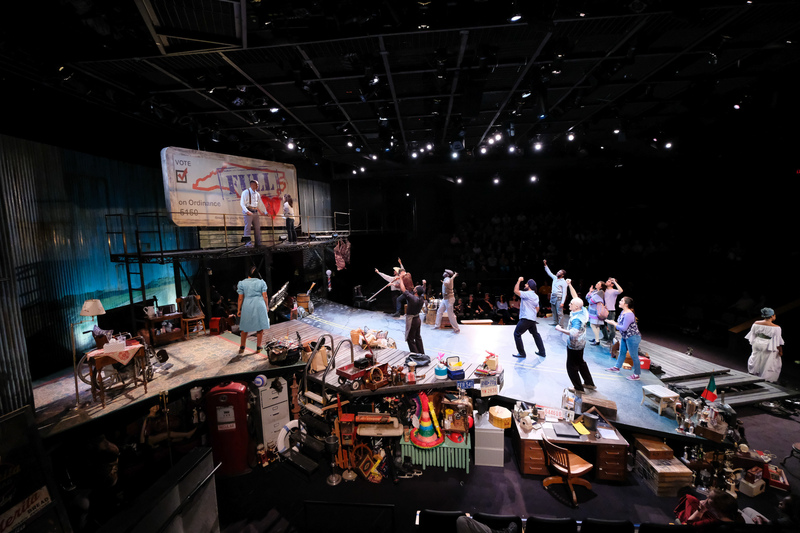 Nearly every piece of the tumultuous amount of “junk” weaved within and around the stage actually came from PlayMakers’ very own props storage facilities. 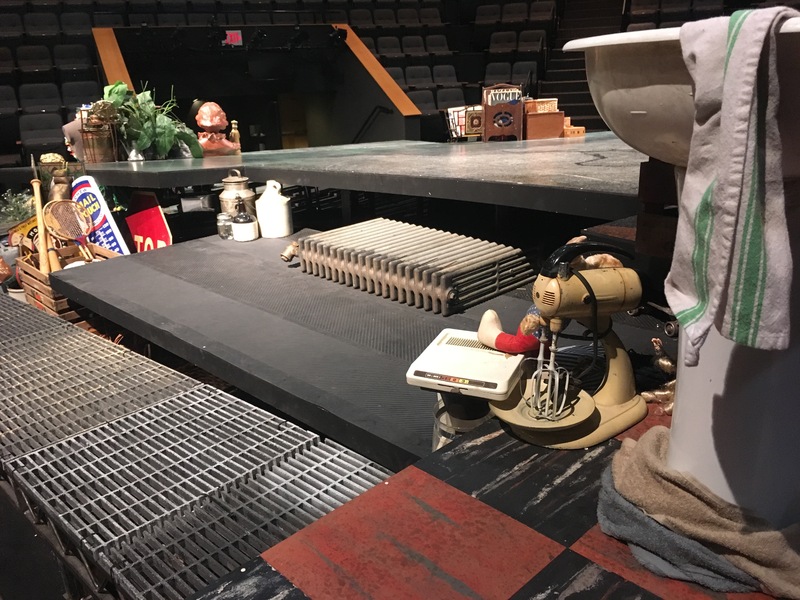 If you’re a longtime friend of PlayMakers, you might notice some of the items dispersed throughout the set, like some nutcrackers from David Hammond’s straight play adaptation of The Nutcracker from over two decades ago. What may be even more exciting, or shocking, is the metaphorical weight that the junk carries—the junk of the past and present weaves time and space together, as the various pieces of trash carry historical and familial weight within the production. Chambers compared the trash to “layers” of our lives. Each displaced item represents history and our individual emotional ties we have to it, let alone the repercussions of human impact. The trash, whether we cling to it or want to be rid of it, is physical proof of what we touch, use, and neglect. Come see this incredible set for yourself! Mike Wiley & Laurelyn Dossett’s Leaving Eden is on stage now through April 22nd. Get your tickets here. Enjoyed this post? Don’t forget to check out Part I and Part II of our Getting to “Eden” series!